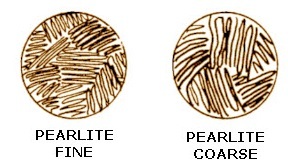 Pearlite is the name given to a mechanical mixture of about 87% ferrite and 13% cementite having a two phase micro-structure and found in some steels and cast irons. Pearlite results from the transformation of austenite of eutectoid composition and consists of alternating layers (or lamellae) of ferrite and cementite. When e seen in the microscope the surface of appears like mother of pearl, hence it is give name as pearlite. The thickness of alternate plates and the distance between them is governed by the rate of cooling. Slow cooling produces a coarse structure than rapid cooling. A steel with 0.8% carbon is wholly pearlite, with less than 0.8% carbon is hypoeutectoid and with more than 0.8% carbon is hypereutectoid steel. The former contains ferrite and pearlite and is soft while the latter contains pearlite and cementite which are hard and brittle.